Steven Gullotta Industrial Metal Spawn of Psychosis originally began out as a bedroom recording project when frontman and founding member of the band SPAWN (Chris Dredge) was merely 16. Since then, with hard work and effort, the small project emerged into a four man performing band in the UK industrial/metal scene. It was earlier at the start of the year that they released Mind Over Mania, a release that benefits the mental health charity MIND. Four tracks stemmed out from this, the first of course being a short introduction called First Session. Ambient sounds begin off, followed by what seems to be a session with a therapist, though the sounds of someone crying deems that the session might not be going so well. The sounds soon fade, and we're delivered into the next track. Coffin Light gives off some riveting guitar work with drum work somewhere underneath, all backed by synth work. The vocals are extremely muddy, and same goes for the rest of the sound. I understand that the release was mastered, however, it still just doesn't sound up to par with other masterings I've heard. I think if it weren't for the quality, the song would have been a LOT better. The vocals change up here and there in Theraputic Care, with a slight distorted effect layering the vocals. This song comes off more clear than the previous, but there is, even though it's mastered, still an overall demo like quality to the song, which squashes its full potential. Asylum Nursery Rhyme is a song that progresses as it goes on in its seven minute length. Guitar work mixes with electronic ambient noise, sometimes samples coming in here and there. It isn't until around the two minute and twenty second mark that guitar work finally comes in. I'm not sure what type of effect was added to the vocals, but it made it sound garbled, almost as if they were underwater at this part, and I didn't like it. That does go away, thankfully, with later vocal work. The rest of the song is pretty smooth sailing, and this time around, I didn't have much to say in terms of quality. They did pretty well. 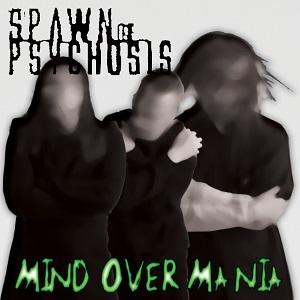 Spawn of Psychosis originally began out as a bedroom recording project when frontman and founding member of the band SPAWN (Chris Dredge) was merely 16. Since then, with hard work and effort, the small project emerged into a four man performing band in the UK industrial/metal scene. It was earlier at the start of the year that they released Mind Over Mania, a release that benefits the mental health charity MIND. Now, I wouldn't say these guys are bad, In fact, their compositions are pretty damned good from what I heard of them so far. However, as I said a few times in the review, they really need to get this stuff mastered in a better way in order to show off their true potential. This sounds like something that ought to belong as a demo, not an official release. Nonetheless, there is capability within these artists, they just need to really strike it out next time.